Wen Liu is licensed to practice law by the Tennessee Supreme Court, and is also authorized to practice law in China and in Finland. Wen earned her Bachelor of Laws Degree in International Law from Jilin University Law School, her Master of Laws degree in Contract and Commercial Law from Helsinki University Faculty of Law. Wen received her another Master of Laws degree from Emory University School of Law. 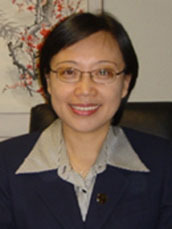 Prior to establishing her law firm, Wen worked nearly 20 years for an immigration law firm in Atlanta, Georgia, a business law firm in Helsinki, Finland and in Beijing, China. Wen also taught Contracts and Business Law in Mikkeli Business School, Finland and Beijing Second Foreign Languages Institute in Beijing, China. As an immigrant herself, Wen went through the immigration process both in Finland and in the U.S.A. She fully understands the immigrant "journey", both personally and legally. Wen speaks Chinese, English and Finnish. Wen is a member of American Immigration Lawyers Association and American Bar Association. Copyright @ Law Offices of Wen Liu-Spehar & Associates, P. C. All Rights Reserved. © 2009 Wen Liu- Spehar & Associates, P.C. All Rights Reserved.